Former Fed chair was recently hired as an adviser to a hedge fund, and will continue as a fellow with the Brookings Institution. Former Federal Reserve Chairman Ben Bernanke is joining Pacific Investment Management Co. as a senior adviser, his second consulting agreement with a top money manager in as many weeks. Bernanke will contribute his economic expertise to the firm’s investment process, the Newport Beach, California-based firm said Wednesday. Bernanke previously spoke at Pimco’s client conference in March and advised on the last two of its quarterly economic forums that guide investment strategy. At Pimco, which suffered record redemptions following the departure last year of co-founder Bill Gross, Bernanke will also engage with clients. The 61-year-old, who led the U.S. central bank during the deepest economic downturn since the Great Depression, earlier this month joined Citadel, the hedge fund run by Chicago billionaire Kenneth Griffin, to advise on monetary policy, financial markets and the global economy. Bernanke is working with only these two firms, according to DJ Nordquist, a communications director at the Brookings Institution in Washington, where the former chairman is a distinguished fellow in residence. 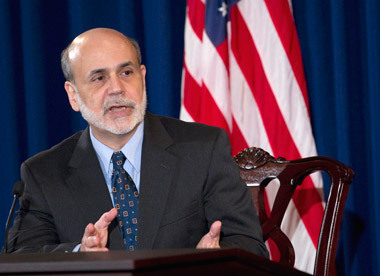 Bernanke remains a full-time employee at Brookings, she said. The money managers are turning to the former Fed chairman as they try to navigate the end of more than six years of near- zero interest rates and unconventional monetary policies that Bernanke oversaw before he left last year. “I am delighted to work together with Pimco’s strong team of investment professionals and contribute to its investment process in my role as an advisor to the firm,” Bernanke said in the statement. Pimco, which oversee $1.59 trillion and still runs the world’s biggest bond mutual fund, is seeking to reassure clients and fortify its ranks after the departures of co-chief investment officers Gross and Mohamed El-Erian last year. It hired Joachim Fels, former chief economist at Morgan Stanley, as global economic adviser; Gene Sperling, a former economic adviser to two U.S. presidents; and Nobel laureate Michael Spence as consultants on economic policy. Alan Greenspan, who retired in 2006 after 18 years as the head of the U.S. central bank, later signed on as consultant to Pimco.